Exclusively for Codonics imagers, DirectVista Paper is available in a variety of sizes, including 14" x 17" and 11"x14", providing cost-saving alternatives to large format film. 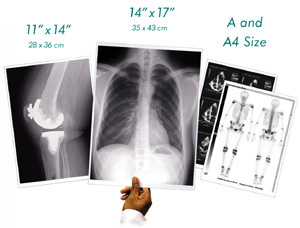 Our A and A4 size output fits conveniently into a chart so that the image can follow the patient and doctors can easily flip to it, like a note or report. DirectVista Paper produces stunning grayscale prints with outstanding contrast ratios. There is no toner, wax or ribbon to replace - ever. 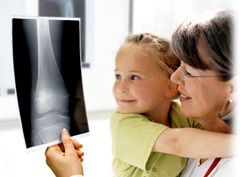 It's the ideal media for patient and referral copies as well as archiving. Reduce your film budget with DirectVista Paper. Substituting 14"x17" paper for large format film immediately reduces your hardcopy cost by 25%, while placing key images on letter size paper increases the savings up to 65% over film! DirectVista Grayscale Paper has a heavy, photo-weight base material that resists water and tearing. Since there is no ink or toner, images never smear or transfer onto hands or other prints. * Contact your Codonics representative for model configurations and media availability. DirectVista Paper is available for use in most Codonics imagers, some model and size restrictions apply. Specifications are subject to change without notice. Contact your Codonics representative for the latest information.